'Ten rules for ensuring autistic people and people with learning disabilities can’t access healthcare…and maybe what to do about it' is the provocative title of a publication that's become essential reading for healthcare professionals. Did you know that the majority of individuals with learning disabilities and those on the autism spectrum don’t access the healthcare system because they don’t believe they will get effective treatment? About 25 people with learning disabilities die each week from causes of death that are avoidable through accessing good quality healthcare. Furthermore, women with learning disabilities die on average 20 years younger and men 13 years younger than others. This can be due to delays with diagnosis, problems with identifying needs and difficulty providing care in response to changing needs. So what can healthcare professionals do to win trust from people with learning disabilities? Don’t dismiss the experts by experience - the individual, parents, carers and support workers. Ask yourself what is the individual's preferred means of communication, for example, photos, signs, symbols. Have you used the TEACH approach? Involve us in conversations. We know ourselves best. Understand that healthcare appointments in unfamiliar surroundings are an anxious experience for anyone and we may also not understand the purpose of the appointment. Make reasonable adjustments. For more insights into improving access to healthcare for people with learning disabilities and autism read Ten rules for ensuring autistic people and people with learning disabilities can’t access healthcare…and maybe what to do about it. Ten rules is a series written from the perspective of those with learning disabilities and on the autism spectrum to support health and social care professionals, support workers, trainers, teachers and students. Each publication contains ‘ten rules’ with practical suggestions to promote positive practice and looks at ways in which environments, services and people can unconsciously create problems for those they seek to support. 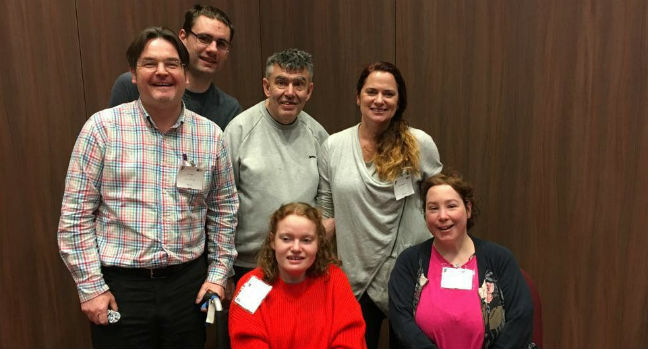 Image: Jim Blair, top left, joined by Viki Ainsworth, top right, her daughter Tilly, centre, and other members of the Ten Rules team at LDT London 2017.